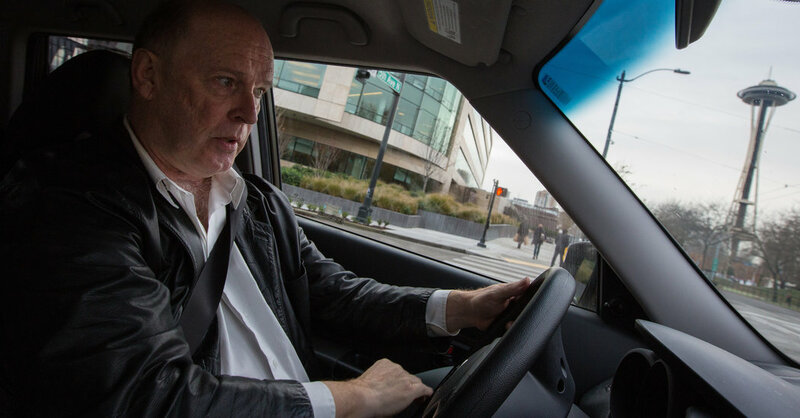 Don Creery works full-time driving for Uber. He is one of the leaders of the App-Based Drivers Association (ABDA) in Seattle, which is affiliated with Teamsters Local 117. In this interview he tells what it is like to organize independent contractors. SA: How did you start driving for Uber? Because I come from a union family, the very first day I drove for Lyft, I’m driving home at the end of the day, it hit me: an American business is not going to allow me to make $30 an hour for very long, and I knew the day was gonna come when we’d be organizing. I mean, I knew that. Those were the early days. People loved it. The Facebook forums and comments were all talking about the great time they had, the great rides they had, and how much money they were making. It was very supportive and there was a lot of optimism. SA: You started as an independent contractor? Companies like Uber and Lyft initially presented their services as “ride-sharing” rather than taxi driving. There wasn’t yet the rush of trying to get as many drivers on as possible. This is not what it’s like now. On the Facebook pages, there’s no enthusiasm. There is general animosity and bitterness. There’s a lot of rancor on all driver websites. SA: What are the hardest aspects to working for Uber or Lyft? C: Having to do it twice a day… I’ll start the morning rush hour, I’m fresh and the morning rush hour doesn’t seem to be as stressful. … Now, because of the rate cuts, I often time have to work the afternoon rush hour as well. Prior to the rate cuts I would’ve logged out by then. … I’m tired, I’m more likely to get stressed out, I’m more likely to make a mistake in the afternoon than in the morning rush hour. I shouldn’t be driving two rush hours in a day. That’s the hardest aspect, the hours are longer for driving jobs. There are rules pertaining to how long people are supposed to drive and I personally believe they’re too lax and not enforced, and I think it’s really dangerous. Drivers are encouraged to drive longer than they should be. To me driving a 12-hour shift is too long. SA: Now that you’ve been involved in the union drive, you know a lot of other drivers. How did you first start communicating with other drivers? Did that happen before you started trying to organize? C: No, not much. Most of the communication was over Facebook pages. There were some meet-ups but they were usually just the same five people. You really don’t contact many people and that makes organizing really difficult. Its rare to find a place where you’ve got more than a half dozen drivers in the same place at the same time. SA: How did you got involved organizing ride-share drivers. C: I started driving for Uber as well. In December 2013, they did this big push to attract Lyft drivers to come over and drive for them. They invited us down to their office, they had pizza and gave us a $50 gas card, and said “Hey drive for both” and in December if you do 20 rides you’ll get a $500 bonus, so of course everybody jumped on that. That was kinda when everyone started driving for both. In August 2014 was when the rate cut happened. August 3: now, I had been clearing like $150 easily a day, sometimes $200, never working 8 hours; I worked all day that day, I got 18 rides, and my gross, before Uber got their cut, was $118. I was fairly stunned. I looked at the mile-rate and was stunned. It was always there, but when you’re making a higher rate of pay, it’s something you don’t pay attention to; it’s baked in, you don’t worry about it. The teamsters had decided that Seattle was the city that would be the place to focus the energy [around rideshare drivers] because Teamsters 117 is the largest local to the west of the Mississippi, has the most resources, people, etc. There was also the feeling that the demographic due to [passing the $15 minimum wage] and the makeup of the city council was very amenable to this being the place that it would be. The goal would be a collective bargaining bill. The real problem is across the country, cities and mayors are just cowering in fear before Uber. I mean, these companies, they set up and break the law and cities just look the other way. That’s what’s happening, and Seattle is one of them. Cities have the authority to regulate “For-Hire” drivers, which is what we are. I don’t know how many cities have passed laws, but Seattle did in 2014 and forced us to have “For-Hire” licenses. So with the Teamsters they laid out that strategy and I started attending meetings with other drivers, some of them from the previous attempt at organizing. We went out trying to recruit drivers – a very tedious process. SA: Talk about how you recruited drivers to ABDA. C: Oh lord. Go up to Broadway and see if cars that were parked had the Uber emblem or the Lyft moustache. Or someone is sitting there and waiting and just going up and knocking on the window and asking “Are you an Uber or Lyft driver?” Talking to them. Starbucks on Olive Way, drivers hang out there. Starbucks on 23rd and Jackson, hang out there. Slow tedious process, you don’t get many people that way, but that’s the alternative we had to do. We hung out at mosques when services let out, that actually worked a little bit better. It’d let out and we’d get like three or four people who signed up for more information. Later on, I would hang out at the Uber support center. There were two types of people coming out: the type who were first getting started and they’re suspicious. Or you run into people who are down there because they’re really ticked off about something. Those people were approachable. But still a really tedious process. Then Uber really made this whole thing happen. In February  they brought us all together to make this announcement about “rate changes” which we all knew was gonna be [further] rate cuts. Rates were cut another 25 cents a mile. Next thing I hear, there are meetings being planned; the Teamsters are being flooded with phone calls. We had a series of meetings with 75-100 people at each meeting. That was where it really took off. We had great meetings. At the last one the Teamsters put together a trip down to Olympia because at that time the state legislature was debating SB5550 which had many things that pertained to [“ride-share” companies]. The main issue was that Uber was attempting to have the state pre-empt regulatory authority from cities counties and courts to the state – which is essentially them deregulating themselves. Our goal was still a collective bargaining law and if this state law passed we’d pretty much have to give up the whole idea. Our intent was to work through the city to get what we needed. We’d never be able to get a collective bargaining law passed through the state. So 36 of us bused down to Olympia. That was the day where I things really coalesced. We became empowered. The Teamsters gave us a lobbying training and the day was very impressive. It was great seeing how powerful the Teamsters were. We were just drivers but because of the Teamsters the legislators would come right out and talk to us for a while. Three weeks later [the worst parts were stripped out of the bill.] Two of the [legislators] voting on it said that they had changed their vote after talking with drivers the week before. That was a big victory for us. We were listened to and had some power. It meant that we could proceed forward and [founded our association, ABDA]. We had a meeting then in August where [we were informed that] Seattle councilmembers determined that there were the votes, and they voted [the collective bargaining law] out of committee before the election. They ended up voting on it just after the election, but it made it one of the issues in the campaign, which was a good thing. SA: What types of things has Uber or Lyft done to make organizing harder? C: It can’t be harder than us not working together. There was one driver who spoke at the press conference where we announced collective bargaining legislation and he was deactivated 2 hours later on what was proved to be an absolutely bogus situation. Once the press and the Teamsters got a hold of it he was back on within 2 hours. SA: What did you win? C: The collective bargaining [law] is going to give us the right to negotiate for better pay and negotiate for a lot of small things, like the driver-rating system being not automated. Right now, it’s an automated system where your rating goes below a certain level and you’re automatically deactivated. There can be reasons for that. Maybe you’re a driver that’s Muslim [and get] called a terrorist and told, “go back to Arabia,” but no one’s going to put on their low rating as a reason, “I don’t like Muslims.” They’re just not going to put anything. There’s a great article from Think Progress on this collective bargaining law from the perspective of the safety of riders. These TNC [or ride-share] companies are trying to perpetuate that these [drivers] are just doing this part-time for “extra” money. And you know that sounds really fun upfront, but is that really what you want to base a personal transportation system on? People who are just doing this here and there, don’t really have anything invested, aren’t going to be as good drivers as people who do it day in day out. SA: What do you think will be necessary to win a contract with Uber or Lyft? C: I can’t even speculate. It’s gonna be a long battle. They will push, it’ll probably go to the supreme court. SA: What message do you have for other TNC drivers or independent contractors around the country? C: You have to get organized. We’re really, really vulnerable in these jobs, and that’s the whole idea. You’re standing by yourself and it’s NOT working. You have to get organized. Right now, it’s about drivers, but the whole intent is long term: to address the independent contractor situation. California is working on a statewide bill to be applied to all independent contractors.